Despite ear plugs and headphones blasting music the MRI folks provided, I wasn’t really prepared for the pounding and jack hammer noises for forty-five minutes. I don’t remember my first-ever MRI in October 2011, after I had a seizure while running in the Zombie road race. Yes, the drugs were that good. When I had a second MRI the morning of my Gamma Knife surgery several weeks afterwards, I did have a little happy medicine in me, but not too much since I had to be coherent for my surgery. The cage attached to my head by four screws was my biggest concern, and I figured nothing could beat that squeezing sensation. For my third MRI on November 14, 2012, I decided I would undergo the procedure without medication. As the MRI folks slipped me into the Open-MRI machine, I settled in, imagined floating on water, and soon heard Taylor Swift singing “We Are Never Ever Getting Back Together” through the headphones. Wait! The Ramones “I Wanna Be Sedated” screamed from somewhere in my brain. Mr. MRI sings boom-boom-boom-boom-boom-boom-boom, and I pretend to hear “Ba-ba-bam-ba-ba-ba-ba-ba-bam-ba, I wanna be sedated.” But Taylor Swift keeps interrupting: “Ooh-eee-ooh, we are never ever getting back together.” I think: Wait…this is my time…my happy place…Ramones…“I can’t control my fingers; I can’t control my brain…I wanna be sedated.” I consider pushing the call button, but it feels like a fat minnow in my hand. The mad music machine continued playing songs I had never heard of while the MRI beat out its own form of torture. Was this hell? Some forty minutes later, I heard the unmistakable sound of Toby Keith’s voice singing “Every Dog Has His Day.” “It’s about time,” I muttered to no one. Even though I had never ever heard the song before, I thought it was a sign from the music gods. After all, I had just written about a dog in a pre-MRI post on my blog. In my shaken, but not stirred brain, I believed Keith’s song meant my latest MRI would show a much smaller tumor. After several days of waiting, I finally received an email with my results: “[The tumor] may be slightly smaller.” Further into the report I read: “There is now note of fairly extensive…edema involving left temporal white matter.” I knew from previous conversations with the Gamma Knife folks that edema around a tumor after radiation surgery is fairly common and could be responsible for my balance issues and headaches. Well, funky cold edema! Dennis from Gamma Knife phoned me the next day after he conferred with the neurosurgeon. My MRI report was “as expected.” As for the edema, it would eventually go away, perhaps in two months or two years. I had three choices as for taking care of the edema: deal with it, take steroids for three weeks, or have brain surgery and remove the tumor. They highly recommended I did not have brain surgery. That works for me: I never ever want someone to cut into my head if it isn’t absolutely necessary. Bring it on, funky cold edema! Dizziness? Barometric-pressure-fueled headaches? I grew up in Dodge City, Kansas, SBT, and I’m not afraid of you. Next November, I will have another MRI, and I hope my SBT, will have gotten a little smaller. I know I have some challenges in front of me, but that’s the way it goes in life. I am thankful for my family and friends putting up with me during this really crappy year. I could focus on the grief I have felt during the death of my father and dog this year. I could focus on the way having a meningioma has affected my life. Instead I have discovered that I need to focus on the joy music brings me. I realize that even if I could return to the life I had before I got smacked in the head, I would never ever wish for the old me. I have learned a lot about myself this year and what I should be focusing on. My family and friends are what get me through my days of uncertainty, and music, sweet, sweet music is all the sedative I need. Well, and maybe a nice cold beer at the end of the day. I will admit it: I’m obsessed with my brain. Here is a snapshot of my brain on November 16, 2011. Pretend you are facing me. There is a golf ball on the left side of my head. It does not belong there. I was not on a golf course when someone accidentally hooked a tee shot, watched it take a Happy Gilmore bounce, split my head open, and lodge in my left temporal area. 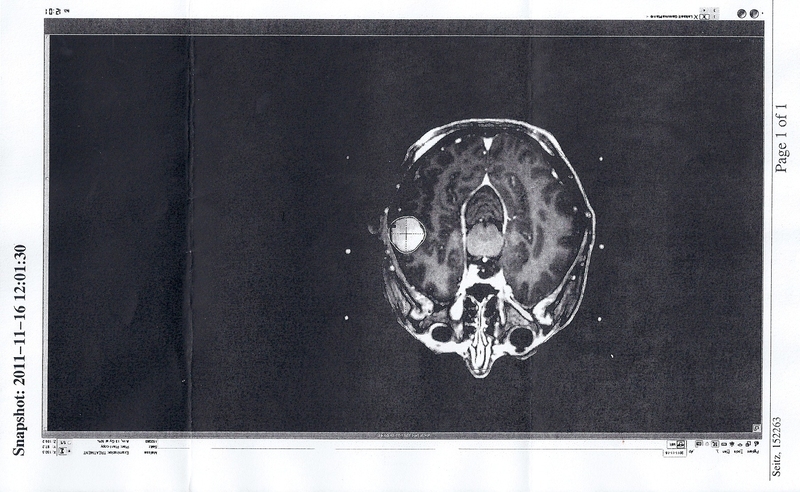 The meningioma has been growing inside my head, rather taking up residency without my approval or a background check. I should charge it rent, but if I do, it requires a name and a checking account. Actually cold hard cash will do. Yeah, listen to me, dog, before you start to whine. That side’s yours and this side’s mine. So move it on over, rock it on over. Move over little dog, a big old dog is movin’ in. On November 16, 2011, I had Gamma Knife surgery; 54-minutes of radiation was aimed at my head to slice and dice the SBT. In a few days, I will have an MRI to determine if little dog is moving out. Regardless of the outcome of Thursday’s MRI and the subsequent report, I will never be the way I was before. I see that as a good thing. For one thing, my dreams are better, more vivid, but it could be from the anti-seizure medication I am on. When I wake up in the morning, I think about my friends and family and how lucky I am. Then I move it (my body) on over to the edge of the bed, put my feet down on the floor, get up slowly, breathe in the day’s possibilities, and growl as I make my way towards the promise of a hot cup of tea. On Thursday, I will follow my morning routine as I take my moment in the MRI spotlight; and await the presence of big old dog as she rocks little dog right on out of the picture. Friends David Hayes, Pam Presta Miller, and Cari Johnson Pelava were all members of my wedding party in 1978. When I moved from Dodge City, Kansas, to Hermosa Beach, California, in 1976, they were some of the new friends I made soon after I arrived. Cari and David were former Michiganders and are directly responsible for me meeting Jim—the love of my life. David recently moved back to Michigan, Pam lives in Ohio, and Cari lives in Minnesota. We put our collective heads together and figured out some days towards the end of September when we could spend some time at my house. It was time for a reconnection, since Jim and I had not seen Cari in thirty-four years and Pam in ten. We spent our days laughing, sharing old pictures, making fun of each other, and catching up on each other’s lives. There, however, seemed to be a constant as we enjoyed each other’s company: music. Music played in the background whether we were in the car or in the house. One day when we were traveling, as I rode in the backseat between Pam and Cari, I started singing “Stuck in the Middle with You.” One morning, as people were waking up and wandering into the kitchen for their first shot of coffee, someone mentioned having a weird dream. Naturally, since we all lived in California during Fleetwood Mac’s Rumours album explosion, I started singing “Have you any dreams you’d like to sell?” from the song “Dreams.” The more I fell into this pattern of singing instead of talking, the more difficult it became for me to stop myself. It was as if I had lost sight of language unless it was attached to a song. At one point David asked me how I could remember lyrics for just about any song even though I had trouble remembering things from the past year or two. His question made me stop and wonder: How was it possible that I could remember songs and lyrics? Was I reconnecting to the past through music or because of music? I had been having unusually severe headaches during the summer of 2011, particularly when the barometric pressure rose upward as if a needle on an old stereo, as it finally reached the end of a song. Motion parallax also seemed to happen when the barometric pressure spiraled downward. Everything synthesized on October 29th, 2011, when I suffered a Grand Mal seizure and discovered I had a brain tumor. Now that I look back, it’s almost as if reading Musicophilia during this time frame in my life was meant to be. The warning signs were there, but I failed, or perhaps refused, to heed them. As I continued examining my journal notes from my initial reading of Musicophilia, I noted my fascination with the passage Sacks wrote about a session with one of his patients the poet W.H. Auden attended and said the session “reminded him of an aphorism of the German Romantic writer Novalis: ‘Every disease is a musical problem; every cure is a musical solution’” (274). Why do I feel so moved by that insight into the human psyche? Why has music played such an important role in my life? Maybe I don’t know the answers to these questions yet, but I know I am not alone. I know that music affects my friends as well. One night Jim, David, Cari, and I sat on our deck watching the moon rise over the lake with our conversation further illuminated by several candles burning on a small table. Most of the lights in the house had been turned off. The Eurythmics “Would I Lie to You?” blared from the stereo inside with Annie Lennox’s voice fueling the driving drumbeats while Dave Stewart worked his guitar magic. We noticed Pam, inside, dancing and singing as if no one else existed. It was as if those of us on the deck had disappeared, and Pam had been overtaken by synesthesia—a “fusion of the senses” (Sacks 192). I understood how this could happen, because when I listen to this song on my iPod, it makes me want to run or walk faster as if I could spin myself into the future. I also remember moments of Pretzel Tour road trips with Micki Holladay, Rachael Livingston, and Jeanne Beilke where conversation ceased. Micki would slip one of her CDs into the car stereo, and as an old familiar song began to play, we would sing along while our bodies gently moved, even though we were strapped in by seatbelts. What role does music have in the synesthesia of friendship? And as we sing and remember, are we returning to a time in our past when life was much simpler? To a time when we were young and the future seemed to be a long promise in front of us? I also remember when I taught at Saginaw Valley State University, and I played guitar and sang with the Cremains of the 10th Circle. We practiced once a week in the Cave, multiple times a week if we were going to perform somewhere, and I practiced at home every night for hours at a time. I felt sorry for my husband and dog. Although my dog would place himself next to me on the floor, away from the amps, he would stick with me until practice was over. Jim stayed in the living room or ventured outside while his wife rocked the neighborhood. It was quite important to me to memorize the lyrics of the songs I practiced and not use a cheat sheet during a live performance. This isn’t to suggest I was perfect: I screwed up lyrics quite a few times. The band was loaded with talented people, and I wanted to try and keep up, perhaps convince them I was worthy to be in the band. I wonder now if I could perform live without a cheat sheet. Could I nail the lyrics? When I practice, my fingers seemingly fly across the guitar with abandon, but what about the lyrics—the language of the song? Sometimes I practice with my eyes closed, hoping I won’t have to open them to look at the typed or written words on my cheat sheet. These songs should be as embedded in my brain as much as songs I wrote while I lived in California or songs I survived on during my high school years. If I can answer a question with lines from a song, there has to be a reason. I know that music is the solution to my problem—and I am working my way back into the way my life was before everything suddenly changed if that is possible. Maybe music is my solution because music is how I connected with so many people. Reconnecting with friends and relatives over the past year has reminded me how lucky I am to have such amazing people in my life. I have only mentioned a few of those people in this essay. They are the mirror to my past, present, and future. If Novalis was correct when he wrote “every disease is a musical problem; every cure is a musical solution,” then I am ready for the cure. When I sing some of my original songs such as “Radio” and “Highway Michigan,” my own moment of synesthia forms, and the people in my life, the memories, and the sheer joy I find in the sounds, the images, and language connect and reconnect me to everything that matters.